After an amazing summer studying abroad, I left Roma for Barcelona. Two of my friends from back home landed in Barcelona that same morning and were patiently waiting outside of my terminal. A bit delusional, the three of us eagerly rushed to our hotel on La Rambla street in the heart of Barcelona. We checked in, explored the town for a bit, and then stopped for some fish-bowl sized sangrias before a much needed siesta. We rolled out of bed and walked to the infamous, Espit Chupitos. Chupitos is a tightly-packed bar with a massive menu, over five-hundred variations of shots all for just two euro each. The bar was dark and crowded with young locals and tourist from all over the world, alcohol was lined wall to wall with various mixes, fresh fruits, pringles, and gummy candies. The bartenders were blindfolding their victims, lighting drinks on fire, and everyone was screaming and laughing. Without hesitation, we squeezed our way up to the bar and began drinking. We started with the devils game – five people, five shots, two of the five shots are mixed with absinthe, everyone grabs a shot and you hope for the best. I luckily avoided the absinthe both times that we played so finally the bartender just poured me an entire shot of absinthe and would not continue until I drank. My “luck” was debatable at that point. 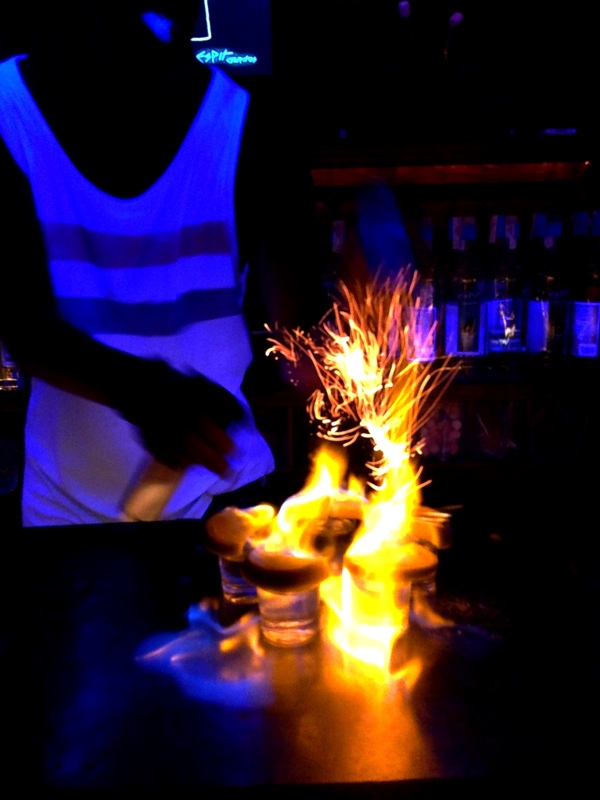 We then tried the Harry Potter shot, which was surprisingly delicious… and also on fire. I really shouldn’t discuss further what else happened at Chupitos, but if you do find yourself stumbling across a Chupitos, do not order the Monica Lowinski, do everything you can to get a friend to order one instead. The next day we crawled out of bed, managed to find one of those obnoxiously large double decker tour buses, and proceeded to cruise all over the city. 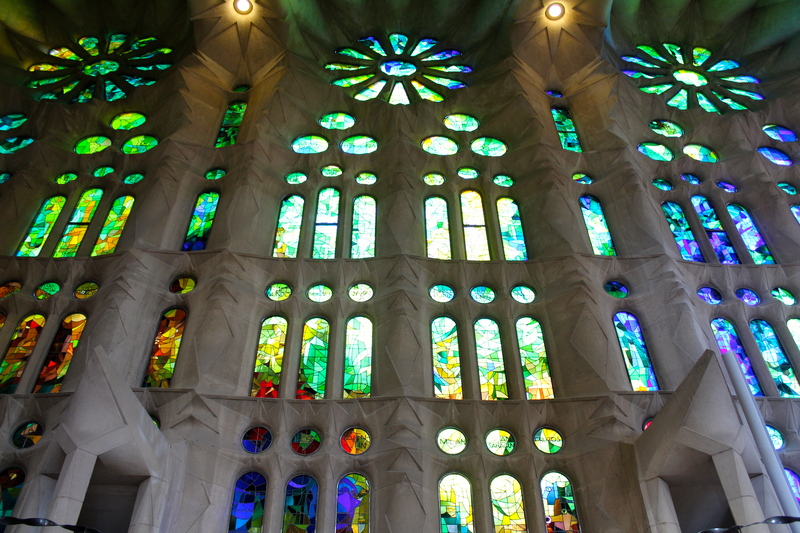 First, we visited La Sagra Familia, the extraordinary architecture and enormous stained glass murals inside were breathtaking. 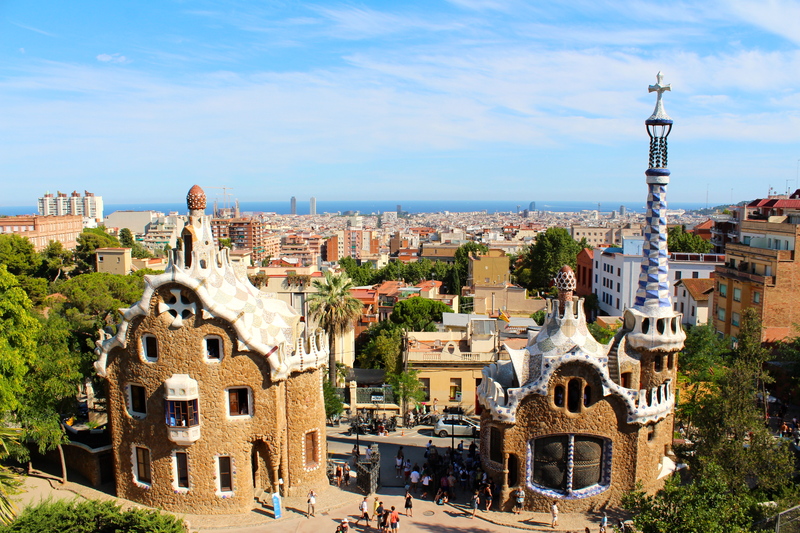 We jumped back onto the next bus and headed over to Park Güell, hundreds of colorful painted tiles lined the walls, grounds, and various characters along every step. We checked out all of the different pieces and then walked up to the courtyard donning a beautiful panoramic view of the city. 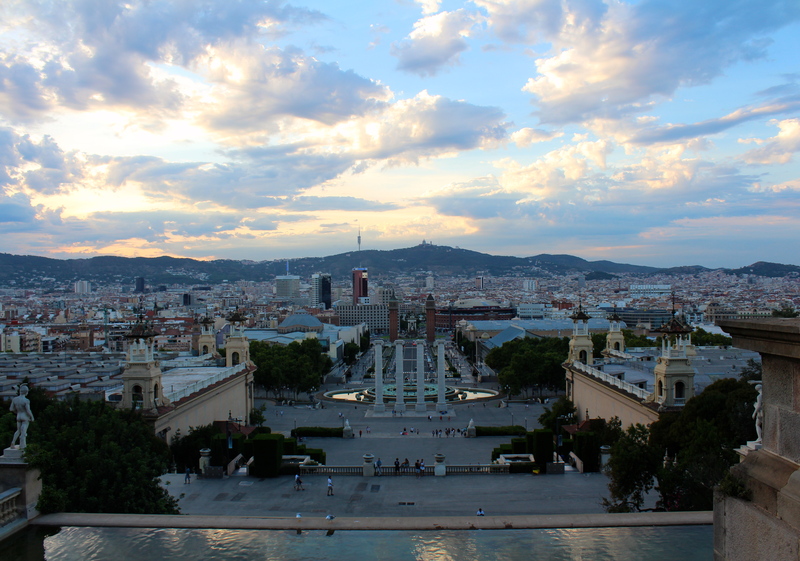 After some more exploring, we trekked across town to the Museu Nacional D’Art De Catalunia, with again, another gorgeous panoramic view of the city. At this point I knew I really loved Barcelona, the nightlife, the city, the culture, everything about it was so much fun and completely unique. We made one last stop at the FCB Stadium. 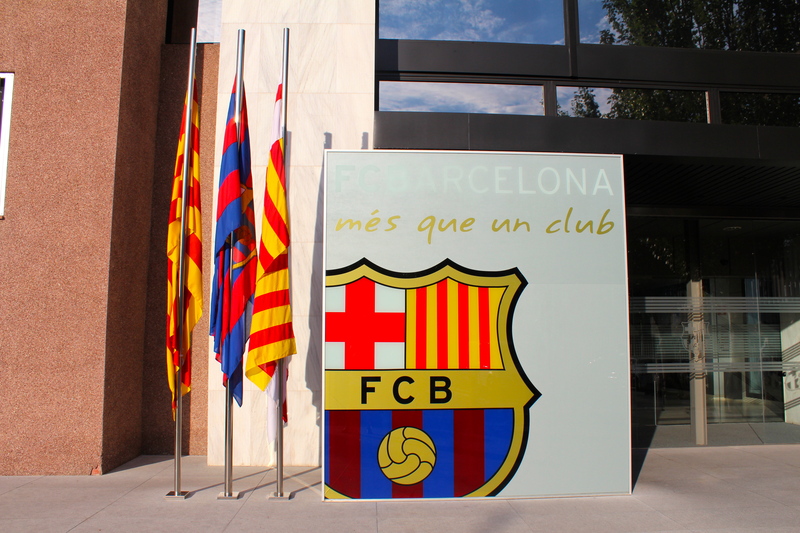 Sadly there were no fútbol games during our time in Barcelona, but I did meet a player outside of the stadium… and by meet, I mean that he said, “Hi” and smiled and could hardly muster enough courage to smile and say, “Hey” back. Close enough. After our day long bus tour we had dinner at a charming rooftop restaurant on La Rambla. I tried my first seafood paella and a lemon margarita… Honestly, I couldn’t recommend either, the paella was overcooked and the margarita was poorly balanced, but after a long day of tourism, I could have eaten a piece of cardboard and been satisfied. Since Europeans are nocturnal, we napped until midnight, got ready, and then went to the beach club, Opium. We got there at about 1:30am and stayed until around 6am. Opium is one of many amazing nightclubs on the beach, just past the port. We met some new friends, danced, drank, danced some more, and drank a lot more. This night was definitely one of the best nights of my trip. I still cannot believe how much fun it was. We stumbled out of Opium and found a late night pizza shop lined with familiar drunken smiles. We chowed down on some greasy pizza and finally went back to our hotel at close to 8am. Two hours later, we somehow managed to wake up, make a quick stop at Zara, and then head off to Madrid. Previous Post Ciao Italia! Si avrà sempre un posto nel mio cuore.